Day 10 of our 30 Days of Cozy brings us this amigurumi Christmas cactus crochet pattern. Well, it’s not really a Christmas cactus….it’s a Christmas-y cactus all dressed up like Santa! 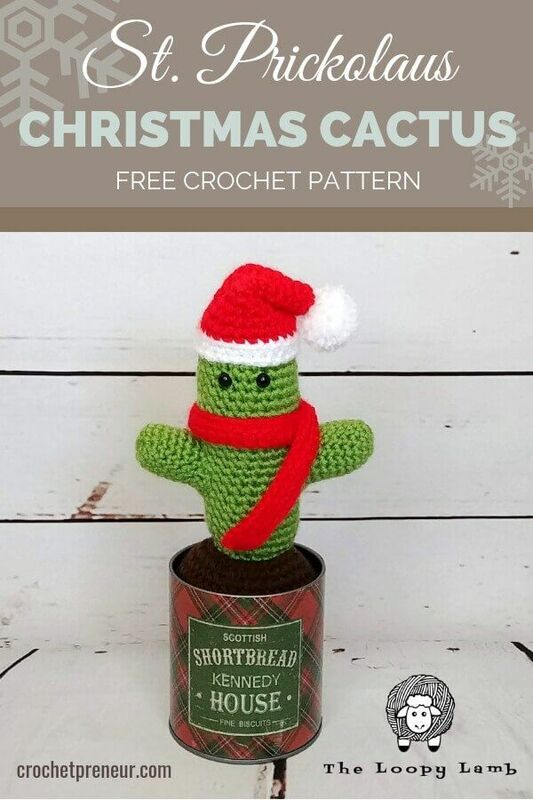 St. Prickolaus was designed by Ashley of The Loopy Lamb and is a companion to her Stanley the Cactus Snowman pattern released earlier in this series. What a sweet way to decorate for the holidays, with these two cactus who long for winter. You’ll get the entire free pattern, below! Purchase the ad-free PDF of this pattern on Etsy. Measurement(s): Approximately 8” tall from bottom of soil to top of hat once assembled. Insert safety eyes in Row 9, with 2 stitches in between them. Stuff the body of the cactus as you go. FO leaving a long tail for sewing onto each side of the body. Using white yarn, CH 24. Join with a sl st to first ch to form a ring. FO leaving a long tail. Make a mini pompom and secure to hat. Bend the top of the hat off to one side and use the tail to secure the tip of the hat to the side of the hat. Weave in your ends. Using a long piece of white yarn, sew the hat onto the top of the cactus body. Using red yarn, CH 61. FO and weave in ends. Wrap the scarf around the cactus body, just above the arms and sew onto body at the point where the scarf crosses over itself. I know you’re going to love making the Cozy Reversible Cowl and I so look forward to seeing your finished product. Ashley Parker is a crochet artist and designer that lives in Hamilton, Ontario, Canada with her wonderful husband and 2 sweet children. On her blog, The Loopy Lamb, Ashley shares her passion for crochet and crafting. A crochet addict, self-proclaimed yarn hoarder and nerd, Ashley started crocheting as a way to relieve stress and help deal with anxiety. Crochet quickly became a passion and soon she was designing her own patterns for everything from hats to amigurumi. When she isn’t crocheting or designing, Ashley can be found spending time with her family, baking, watching the Harry Potter movies on repeat or pursuing opportunities to work with owls and other birds of prey.